FormDocs provides digital signing as a way for you and others to indicate that you have read - or approve - specific information on a form. 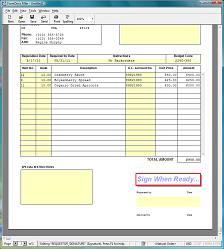 Digital signatures are applied by pointing and clicking, by handwriting on a signature pad device**, or by handwriting on a Windows Tablet computer. When a form is digitally signed the information being endorsed becomes locked, meaning that no one else can change it. This guarantees that anyone who later views the form will see the original information that was present at the time the form was signed. If anyone attempts to change the original information, FormDocs will sense that it has been tampered with and will alert whoever is viewing the form. This ability to guarantee the integrity of information on a form is one of the most important benefits of using digital signatures. The ability to authenticate the signer's identity is another important benefit of using digital signatures. 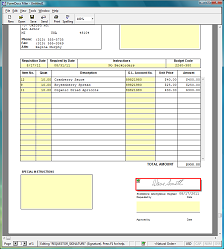 When others see a digital signature appear on a form they can be reasonably certain of the person who signed the form. FormDocs digital signatures are of the type generally accepted by the business and legal communities as a means to reasonably assure the authenticity and integrity of a document. * Thus, when you apply your digital signature to a FormDocs form, it is just as if you had signed it with pen and ink. * FormDocs digital signatures are industry-standard, PKI-certificate based. Topaz Systems, Inc. - Provides Electronic Signature Solutions for Digital Documents, Including Complete Software, Tools, Robust Hardware Pads, and Lifetime Support.